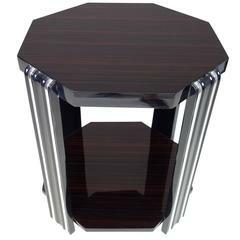 Amazing Art Deco style coffee table in mahogany. The upper and lower parts are veneered with stunning mahogany and have a brilliant grain. The brown veneer combined with the excellent black piano lacquer are a wonderful color combination. Circular chrome lines accentuate the piece and create, together with its beautiful colors, a real eye-catcher. Perfect for any room in your home! Wonderful coloring game accentuating chrome lines hand polished on high gloss. Art Deco Nachttisch. Abmessungen: 50 x 32, Höhe 62 cm. 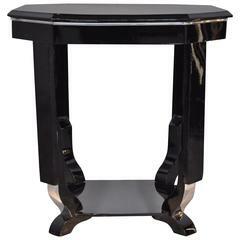 Art Deco-inspirierter Beistelltisch aus weißem Ebenholzfurnier und skulpturalen ebonisierten Beinen. Größerer Art Deco Beistelltisch (passend zu 2 kleineren Art Deco Beistelltischen in den Angeboten) Holz: Mahagonifurnier. 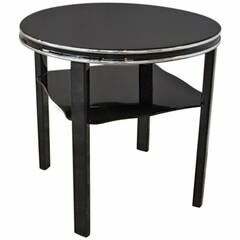 Cute small Art Deco side table from 1930 with original palisander veneer. Furniture is restored with hand-polish.